At one point in our history, journalists were revered. They told real stories about love, war, and everything in between. The news may never have been completely unbiased, but as part of the rules of the trade, journalists did their best to report the facts. Today’s media tells a different story. The media has changed and trends are evolving faster than ever. How does this affect marketing strategies? Has the foundation of what really matters changed? How do communications professionals, journalists, and marketers keep up? 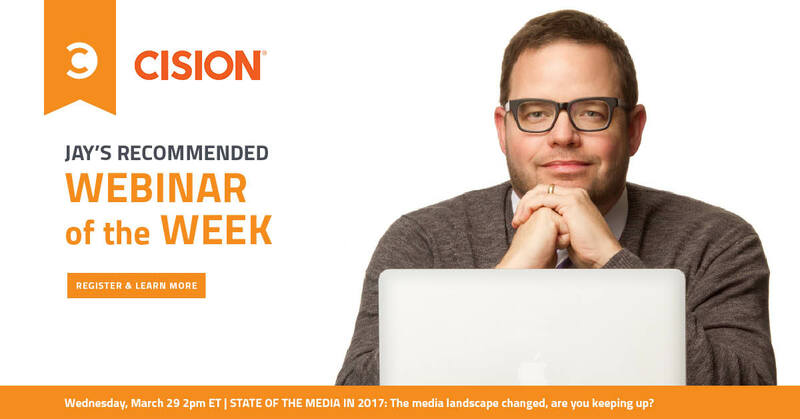 Cision surveyed over 1500 journalists to uncover some troubling data about trust, emotions, speed, and the power of earned media in 2017. But having the data isn’t enough—what are we supposed to do with it? Richard Levick, CEO & Chairman of LEVICK; Katrina Craigwell, VP of Marketing Innovation at GE Digital; and Chris Lynch, CMO of Cision are here to help you re-think your approach to communications and marketing in this hot Webinar on March 29 at 2pm ET. There are some truly terrible media outlets out there. In a world where anyone can publish anything at any time, this is our new reality. These outlets do not have the traditional media underpinnings or the depth of journalism that traditional media values. Perhaps this part of the reason why 91% of journalists feel they’ve lost public trust in 2017. Some will argue that the advent of the internet has meant the death of journalism. But it’s not so much the medium that’s the problem. There is strong journalism happening on web-based news outlets as well as print-based outlets. Priority should not be given to one type of media over the other. But we forget that not all media is created equal and it’s becoming increasingly difficult to discern truth from lies. Earned media matters more than ever. According to the 2016 Outsell report, 81% of senior marketers believe earned media is more effective than paid media in achieving their goals. But earned media isn’t only more important than paid, it’s arguably more important than most other forms of media because it’s what builds trust among audiences. Yet, this isn’t news. Earned media is essential. Traditional media is essential. In our lust for the new and the shiny, we continuously overlook the basics, however the best practices that existed in the early days of journalism reign today. We just aren’t always taking proper advantage of them. This holds true for earned media through public relations as well as through influencer marketing. When done right, earned media can validate and create trust through authentic storytelling, and then new media can be used to amplify these stories. Faster is better… Or is it? In the race to be first, the normal tests of quality control are not being met. Now, is that because of new media? Perhaps. The web has allowed anyone to pose as real media and new media tools make it easier than ever to publish quickly and without fact-verification. But it’s also because click-bait is called click-bait for a reason… people click! Combine audacious headlines with the echo chamber that is our world and we’re left with the rampant spread of misinformation. It’s a depressing reality that has led to the public’s mistrust of the press now more than ever. Marketers need to take responsibility. Marketers are being tested. Will we rise above the sensationalist headlines and rumor-based reporting or will we succumb to emotional click-bait? In light of these challenges, marketers need to focus on telling credible stories and remember that authenticity always wins. A lie can get out immediately, but the truth takes a while to catch on. Marketers must take responsibility for educating themselves. We have to be paying more attention than ever and continuously be asking ourselves whether we can back up our stories with facts and data. We have to be guarded against distractions and not let singular events, whether they’re political or otherwise, determine the direction of the entire landscape.